This blog is officially declared dead. Maybe it will be resurrected as zombie blog one day in the future. If you know us, please check our respective facebook profiles for micro updates until then. 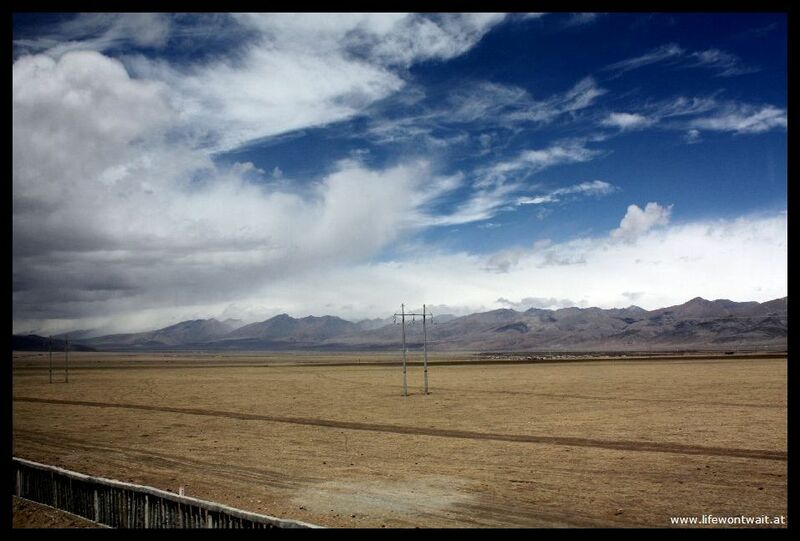 After we finally got our Tibet permits on Wednesday at 10pm we took the train from Xining to Lhasa on Thursday afternoon. The permits were checked twice at the station in Xining but other than that it was chinese-trainstation-business as usual: ticket check – luggage xray – waiting room – ticket check – ticket check – train. The train was the same type as used all around China just with an additional heating, a (completely ignored) complete smoking ban and little boxes labelled “oxygen supply” next to each berth. We could not figure out whether and if yes, how those things worked though. We spent most of our time taking picture and eating our co-travelers food which they seemed to have an endless supply of and kept offering just as equally endlessly. …if you don’t speak Chinese, that is of course :). This post contains 8 tips and 2 restaurant suggestions that might be helpful for non-chinese speaking vegetarians in China. If you are not vegetarian, still read on! Some of the tips might help you too get what you want in a restaurant and there are some pics of weird Chinese non-vegetarian dishes (or soon-to-be dishes) at the end of the article. Before we came to China we have been warned plenty of times that China is a quite horrible country for vegetarians to travel in, mostly because the Chinese cuisine is very rich in meat (of all kinds of animals, known and unknown to western taste), very few people speak English and the concept of vegetarianism is almost unknown. If you are a vegetarian planning on going to China, don’t despair! Things are not half as bad as the rumors make them and below you can find some tips that should make getting your belly stuffed easier. Near the end of the article there are also two types of restaurants that are easy for vegetarians to visit. Chengdu is the capital of Sichuan province (wellknown from every Chinese restaurant’s menue in Europe) and the 2nd most polluted city in China. Xining is the capital of Quinghai province and dubbed “China’s Siberia” due to it’s nuclear dumping grounds and gulag-style military prisons. It is also the birthplace of the current Dalai Lama. We had fun there! After two days in Kunming – which we mostly spent organizing the trip to Tibet – we took another night train to Lijiang where we arrived on Tursday at 7am at chilly 10 degrees. Fortunately it got warmer during daytime but the nighs gave us a first glimpse of the mountain cold we would be experiencing for the weeks that followed. Lijiang lies at an altitude of 2400 metres and neither of us experienced any sign of AMS (acute mountain sickness) which is a good sign but of course no guarantee for not getting it higher up though, as often AMS only starts to kick in at an altitude of 3000 metres or more. 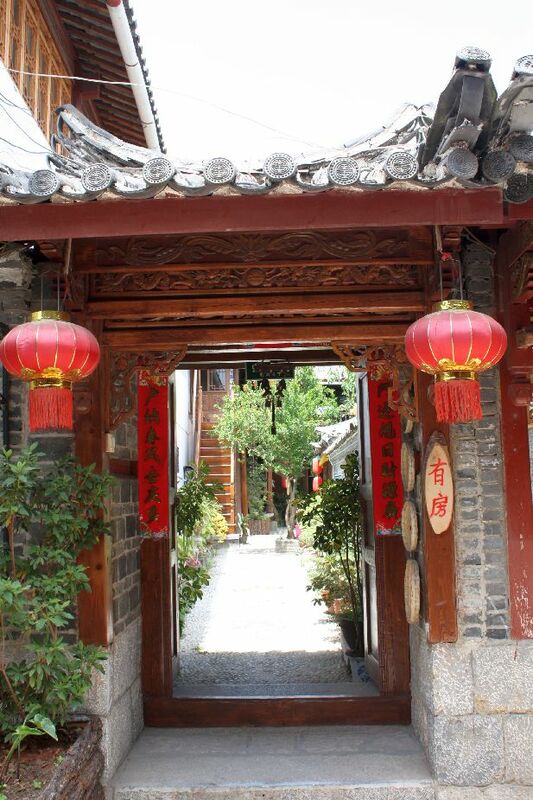 Lijiang is split into an old and a new town and the old town is what hordes of Chinese tourists come to see. Old Lijiang is kind of a traditional Chinese Duckburg with lots of pretty little streets, houses and rivers and is one of the very few places in China with some infrastructure for international tourists (meaning English signs, public toilets…) that we have found so far. For that (and the conservation of the old town) they make you pay a whopping 80 Yuan (~ 8 Euros) entrance fee though. In theory, the accomodation providers are supposed to cash in this old town conservation fee, but our guesthouse owner told us that he does not bother with it because he does not like it and from what i understood most other guesthouse owners don’t either. Yesterday we came back to Guilin after a few days in Yangshuo. Yangshuo is one of the most popular destinations for Chinese tourists, so there is lots of touristical infrastructure and touts are just about everywhere. One of the first things our host Bruno tought us was „bu jau“, which means „don’t want“ and became our most frequently used phrase, especially in the city center. Like many other tourists we got there by bamboo boat from Guilin – rather a raft made of some 7 big bamboo trunks with two little benches on it. The 2-hour ride down the Li river was relaxing and very scenic. We got off in Xingping, which is a little riverside town and also the place printed on the 20 Yuan note. From there we took a bus to Yangshuo.